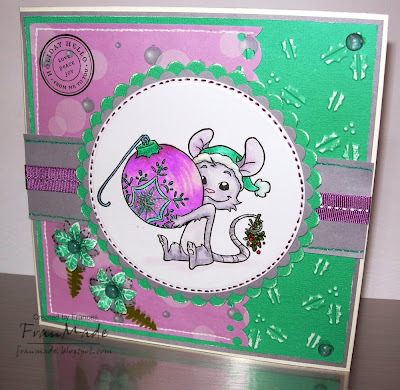 The sentiment is from another CC Designs set which is available from Silly Monkeys and I thought was just perfect for this cutie. 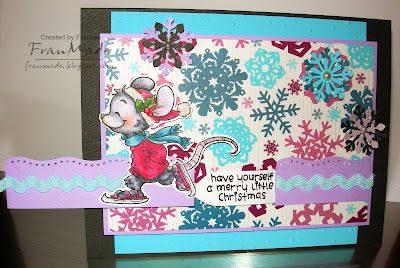 Need to start making more christmas cards seeing as it's fast approaching October. Still not found my mojo but at least I've managed to finish a card even if I'm not 100% happy with it. I've used the colours over on Copic Colour Challenge and all the faux stitching on it means I can enter this into the 'Simon Says' challenge too, if maybe a tad too late! 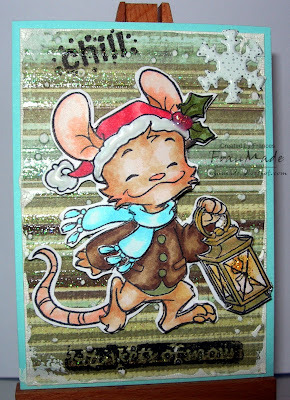 I've used another cute Henry mouse stamp and some old papers I found during my stash clearout. Colouring: Copics with added Sakura stardust pen over the bauble and his hat plus some glamour dust & stickles for added glitter . . not christmas without some glitter! Hello! Sorry for the lack of cards but last week was spent sorting stuff out and trying to clear some bits on "that auction site" . . it takes soooo long and their fees aren't cheap are they?! Anyway, have managed to clear some things including some of my cards (probably cos I batched them up and sold them cheap but rather that then them overtaking all the space in my room as I just can't use them all!) Think I may try selling them individually next and see how that goes. So feel a bit less cluttered now (but not much!) and can try and get crafting again. I finished this card which has been sitting on my desk for over a week waiting patiently. It was for a sketch challenge somewhere but that's long finished so have adapted it to fit this week's WoJ challenge - 3 papers, 2 flowers, 6 brads. Nothing fancy but this cute 'Autumn Charlotte' image from WoJ is so cute I don't think it needs much else. Colouring: Copics for image and bit of distress ink around edge of oval. Right, going to try and catch up on some of my DT things then see what I've missed in blogland. Thanks for dropping by. Hiya, just popped on to say the cards are going to be a bit thin on the ground this week . . . Mojo seems to have gone AWOL. Think it may be buried beneath my overflowing, messy craftroom. So I'm going to have a mini break and tackle a big clearout in the hopes that I'll find it very soon! Hopefully normal service will resume soon as I do have lots of yummy stamps to play with and show you. 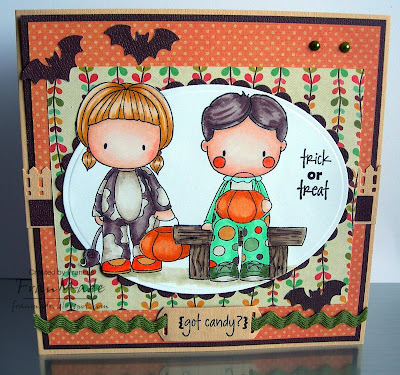 Even though we don't really celebrate Halloween I just couldn't resist these CC Design cuties (available at Silly Monkeys now) and made this card using the sketch/challenge over on truly scrumptious, the 'extra' being to use minimum of 3 stamps. I've used 'clown trevor', 'cow emma' and the 'bench' and have stamped them using masking technique. 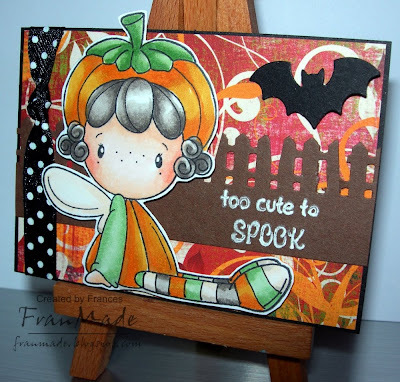 Think the MME bloom & grow papers work well for Autumn/Halloween cards as it has that fab orange colour in it. AND if you didn't fancy a full pack you can now get little 'part packs' over at Silly Monkeys for a £1!! perfect if you just wanted to try them or only wanted it for the odd card. Right must dash, have work tonight . . will fill in the stash bit later. If you're looking for the candy winner to my mini WOJ candy its under this post.
. (using Random.org) . .
. . . which makes it Penni. Congrats! Please email me with your snail mail and I'll pop your little win in the post. CCT theme this week is 'hidden treasure'. So for mine, I decided to incorporate a hidden message somewhere. 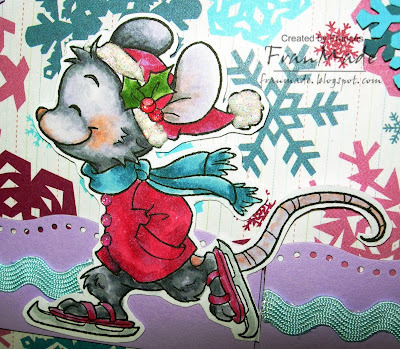 I chose another cute Henry mouse stamp, this time he's skating. Then the rest I made up as I went along, which I think shows, as it's not as polished & co-ordinating as I would have liked. 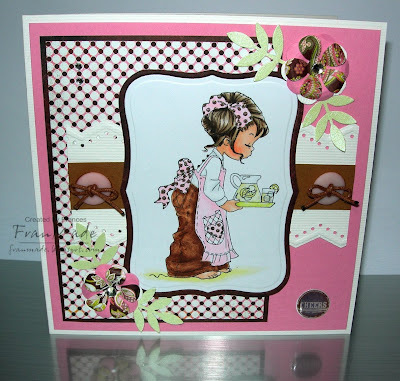 I really can't make a card in one sitting, it has to sit and stew for at least a day LOL If I make another one I'd choose a less busy paper for the background as poor Henry is a bit lost amongst it all! Where's the hidden message I hear you ask? Well, you just pull the little ric rac strip and Henry will skate along to reveal this . . . Right, will be back later to announce winner for my WOJ turkey stamp candy and will try and visit my bloglist tonight- this week seems to have flown by. ATC day today. 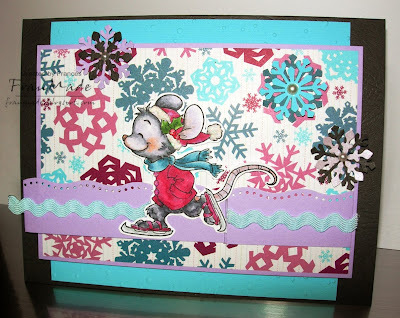 Theme this week is 'layer it up' i.e decoupage. It was an easy choice this week as to which stamp to use, seeing as I had all these super cute WoJ Henry mouse stamps arrive yesterday. So I chose one which would fit on an ATC and would be fairly easy to cut out to create my layers. Isn't he adorable?! I tell you, I'm just so glad I don't have to choose which ones to get as I think all 12 designs are just too cute. I've just grabbed a bit of scrap dp for the backround (embossed it with one of the new cuttlebug folders - snow dots one but hard to tell) then have decoupaged lil Henry and stuck him on with silicone glue. He's made up of 2 to 3 layers depending on which bits I thought should stick out more. May be able to see the layers a bit better on this photo . . . The cutting out and colouring is a bit shoddy in places as it was another rush job, so don't look too closely! Paper: scrap dp from MME Laundry line. Others: white distress crakle paint around edges of dp, woodware white 'fluffy stuff' on his hat trim, snowflake brad in corner. Just a quick post today. Made this using the WoJ challenge of 'turq & orange' and also the sketch over on PTW which ends today! 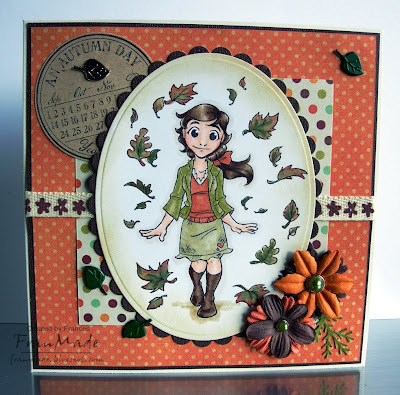 Image is another cutie from the WoJ Autumn collection, again watercoloured with distress inks when I want a more rustic/softer feel to the card. WoJ have released some gorgeous christmas stamps today, but I didn't get my stamps in time (just landed on my doormat today). But then I don't think you'll need any inspiration from me, they are all so adorable you'll want them all. However, if you need inspiration check out what my fellow DT teamies who got them in time, have already come up with here. Right, off to go play with mine now - hmm, which one first?!! P.S don't forget my lil turkey candy is still open, see post under this one. 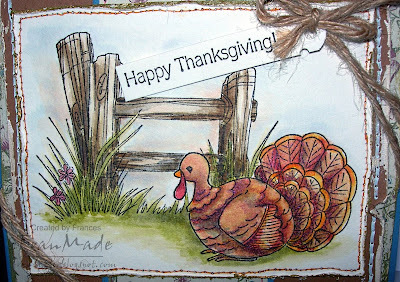 As promised, I have the cute turkey stamp & sentiment (as used in my last card below) up for grabs, courtesy of Katharina/WoJ. I've added in a small 6x6 stack of MME papers from my stash (Wild Asparagus). If you would like to enter the draw, just leave comment by Wed 16th Sep and I'll pick random winner on Thursday - simple! Good luck. I received some more fabulous DT stamps from WoJ and had this scene pop up in my head so just had to make it, even though we don't celebrate thanksgiving over here. Not to any challenges or anything, just went with the flow, just for fun. 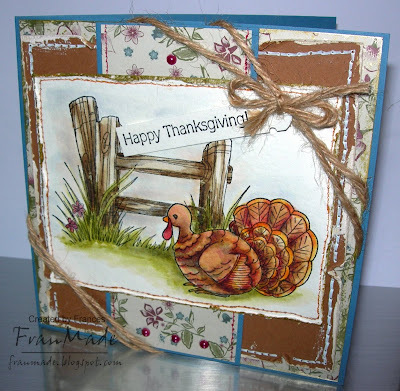 I've stamped this cute turkey (which I will be offering as candy next week), masked it then stamped the lovely fence just to the left of it, using Versafine ink onto watercolour paper. I wanted a vintagey looking card so started by watercolouring my image for a change, using distress inkpads and twinkling H2Os. 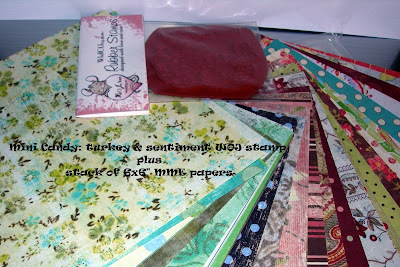 Then chose a country/rustic colour scheme and papers which were then all distressed and torn around edges, with added distress crackle paint too (Kathy's fab idea which I had to try - thanks Kathy, I love this stuff ! got the white, linen and couple of metallic shades too, want the others now LOL especially as it comes with the brush in the pot - ready to use, no phaffing, just how I like it!) bit of faux stitching, added garden twine and made the sentiment into a tag and voila! 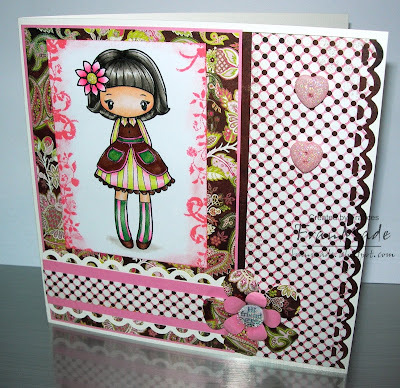 If you love your WoJ stamps don't forget Katharina currently has call out for guest DT slots and is still open, see here . Also, some uber cute christmas stamps will be released next Tues, some of which you can see here and I'm hoping to get my stamps soon so should have some cards made for next week - can't wait as it's cute Henry mouse in christmas mode! May have another card for the weekend but if not, have a good one and I'll see you all next week. As always, thanks for dropping by! CCT: strawberry mint julep . . .
. . . a.k.a pink & green is the challenge for CCT this week. And as the sun was shining yesterday it actually made me reach for this summery fresh piece of patterned paper which had the required colours and the rest just sort of fell into place. Thanks for dropping by and all the lovely comments - I do appreciate it. Got lots of DT stuff to play with but not sure where to start! . . Although clearing some room on my desk & chucking out the rubbish might be a good place to start :/ Have a good day, it's another sunshiny day here, albeit very 'autumn in the air' feel to it! 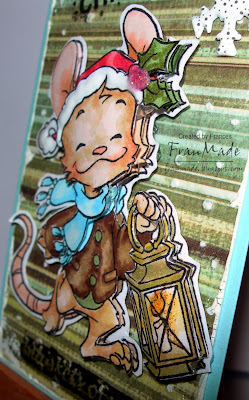 Time for my weekely ATC, sorry bit late - forgot to schedule it! Theme this week was to use shrink plastic or mini images. Afraid the old brain wasn't feeling too creative so it was a quick one this week. I've used a some Alota stamps (oven glove & jam jar) and shrunk the jam jar with shrink plastic then just added this cute tilda from the fall kit and then hand wrote a little heading/sentiment. The jam jar is huge as it still looks big after shrinking it! (got it for my images to sit on before Magnolia came out with theirs). see you tomorrow with my CCT card. Bit later than planned, but here's another cutie from CC Designs. I thought I'd used the sketch over on Truly Scrumptious but it's not entirely 100% - that's what happens when you scribble the sketch down, but not very well! Think you can still see the main parts of the sketch and the colours are Indian summer even if the images/theme aren't! Not doing very well am I, LOL?! Anyway, here it is. 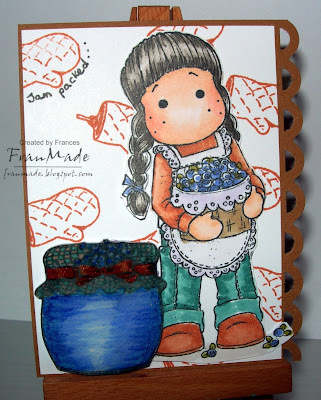 There are 6 or 7 seperate stamps used on this card including the sentiment and the leaves in the strip running behind her; I love the sentiment, which will go with all my other veg/fruit themed stamps I think. All available to pre-order here. The 3 pumpkins at the front are raised on 3d foam and they shimmer, but hard to capture on film. 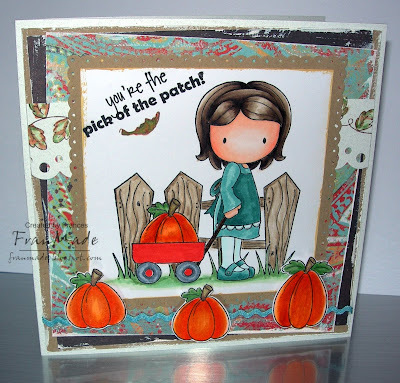 Can see this stamp being very versatile as you can cut off the pumpkin in her cart and put other things in it instead. This is my favourite from the Belles & Whistles stamps by Elisabeth Bell (fell in love with it whan I first saw it as a sketch & have been hoping it would be turned into rubber) and it finally got here last week after customs held her hostage for over a VERY long time. Right I need to go try and get more done today but this horrid weather is just making me feel very sluggish at the moment! Hopefully will be back later tonight with another CC Designs cutie that Bryony now has up for preorder here . After the disaster that was yesterday's card thought I'd go for a nice simple one and made this using the fab sketch over on 'Anyone for Anyas' challenge. Missed their first one last week so wanted to make sure I joined in this week. ( Also used 'pink & brown' for the Basic Grey challenge but that finished and it's a new one today!) Much happier with this one although my photo skills are rubbish - couldn't get it to look right and you can't see the little sentiment in centre of the flower too well. Have a great weekend everyone, especially those of you in the states with your extended labour day weekend.